When Kilgray introduced memoQ Web Search a few years ago, I was unimpressed, because I was fairly efficient at working with the several tabs of my favorite sites to search for information during translation projects and I couldn't imagine much value to be had from an "integrated" search in a stripped-down custom browser. And the buggy example templates shipped with the memoQ release (several search setups are incorrect) didn't help much. It was only when I began to take a careful, systematic look at this feature to document it for my memoQuickies guide to configuration that I realized how straightforward it really was, and since then, despite ongoing bugs in the feature which sometimes lead to crashes, it has become one of the most important practical features of the product for me. Being able to select a text in the source or target and hit a hot key to search multiple sites at once really does save me time. Lots of it. There has, of course, been another product around which does that too, which works in more or less any Windows environment and which is far more configurable. But when I took my first look at IntelliWebSearch (IWS) years ago, I was put off and confused by the nerdishness of the presentation, and I just wasn't ready to be told how many damned options I had when I was trying to get my head around the simplest basics. Recently, however, I have beome increasingly irritated at little things with memoQ Web Search, including the impossibility of adding my user credentials to turn off ads on some sites I use, and I began to wonder if IWS might not be worth another look. And indeed it is. I am a big fan of multiple concordance search sets in integrated translation environments- this isn't a feature in any of them as far as I know, but it is accomplished easily enough. In memoQ I use the integrated concordance feature to search all the translation memories and corpora attached to a project for my "primary" concordance search set. The memoQ TM Search Tool is configured to search another set of TMs, including some with languages other than those in my project. And for blockbuster TM concordance searches with massive resources like the DGT data sets I have TMLookup. That is three differently configured concordance searches available at a keystroke in my working environment, and you can do the same thing in your favorite CAT tool as well. So why not try this with web searches? Searching too many tabs at once tends to be slow, which is why I generally recommend no more than a few favorites be used with the integrated memoQ feature. IWS, unlike my usual tool, offers the possibility of configuring multiple "search groups", all of which can be accessed from anywhere with a hot key combination you assign. So I tried this for a few special sites that I usually don't want in my memoQ Web Search but which are a nuisance to deal with manually when I need them. It took me just a few minutes to install IWS, and with the help of a couple of short tutorial videos on the tool's web site, I had my custom searches set up(the configuration wizard to do this is dead easy and user friendly), and in about 10 minutes I was happily invoking special web searches on multiple tabs of my default browser (where I have configured some sites to shut off the damned ads) while I worked in the memoQ translation and editing grid. So IntelliWebSearch today isn't nearly as difficult to figure out as it seemed years ago. Whether the product has improved or my head is just a little less cluttered now I'm not sure. But it's a very useful tool and a good extension of my working environment which I can recommend with more confidence. I can do useful things without drowning in the depth of its product features. Nonetheless, I wouldn't mind a guided tour from someone with more of a clue than I have. And later this summer I have exactly such an opportunity. 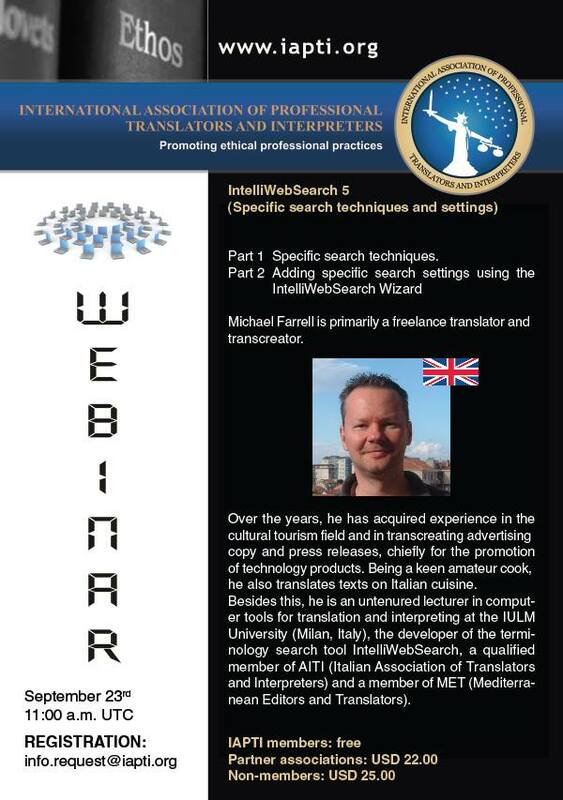 Colleague Michael Farrell, the Italian to English translator who created IntelliWebSearch for all of us, is giving two webinars sponsored by IAPTI, which offer a thorough grounding in the basics of this productivity booster. Information with links (click the images!) is below. I'll be there and hope you'll join me and learn useful things to help in your research of monolingual and multiplingual information sources on the Internet. I also rediscovered IWS a few weeks ago thanks to a translator i work with (i do mainly project management). Just as you, i had tried IWS several years ago and thought, well, (arrogantly claiming) "I can do this myself using my bookmarks and multiple tabs, I am in charge here :-)" so uninstalled it. Then a few weeks ago, this translator showed me advanced options and customization possibilities and i was captivated about the possibilities. He also told me about the search function in memoQ but don't use memoQ for now. He links IWS to Archivarius, so he can centralize searches, but there is an "instance" issue, Archivarius (locally installated program, not a website) has to be closed every time. BTW, i discovered Archivarius and dtSearch, great tools for "local" search in reference material provided or corpora (for Studio users :-). I've used Copernic in a similar way for years. I am still a great fan of memoQ Web Search, just not of its bugs that cause my system to crash sometimes. It is, on the whole, simpler to use, and you don't have to close your tabs to avoid overpopulating them. But IWS offers a lot of sophisticated and useful possibilities not in memoQ, and it will work in more or less any environment under Windows. I think of it not so much as a replacement but as a functional complement within memoQ. And there are little things I like, such as being able to customize my test word for searches. It pisses me off just a bit that I still cannot do that little thing with mQ Web Search. dtSearch is a big step up from Copernic. I swear by the power of IWS + dtSearch. Just add local dtSearch searches to your favourite IWS groups. Interesting suggestion. I've been using dtSearch for going on 15 years. Couldn't do without it. is there any new edition for the book "memoQ in Quick Steps" since its original publication? Several more books were released, though all are rather dated now. I thought to finish a new version of the "New Beginnings" book, which was a hybrid of comprehensive workflow tutorials (written for classes I was teaching) and memoQuickies, but 2018 had other things in store for me, so that work is on the agenda as a solo or collaborative effort for 2019. And I am looking at other ways to teach, with some good possibilities open with platforms for which one need not depend on any inertia-ridden groups or companies.